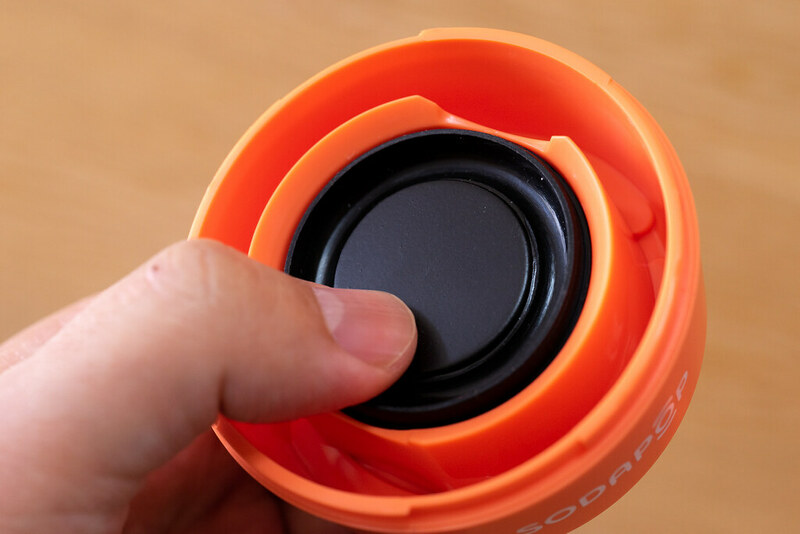 Turn a plastic bottle into a powerful woofer? 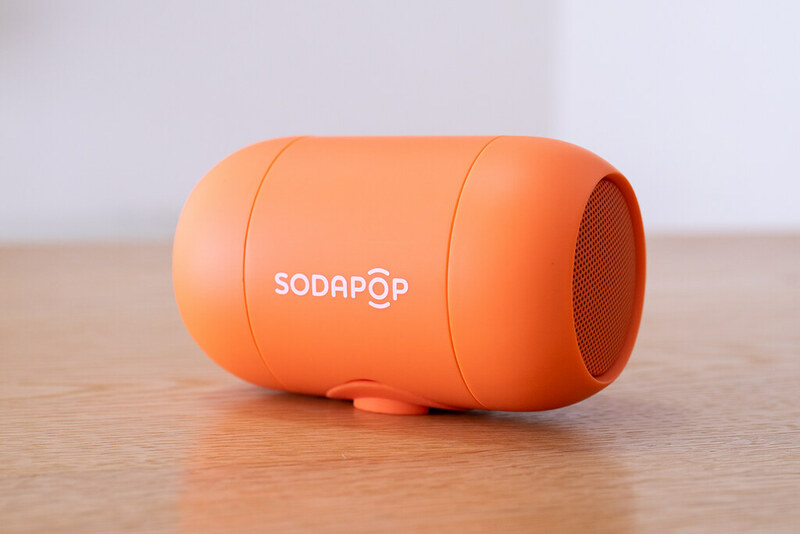 Review of Norwegian-born Bluetooth Speaker Sodapop! 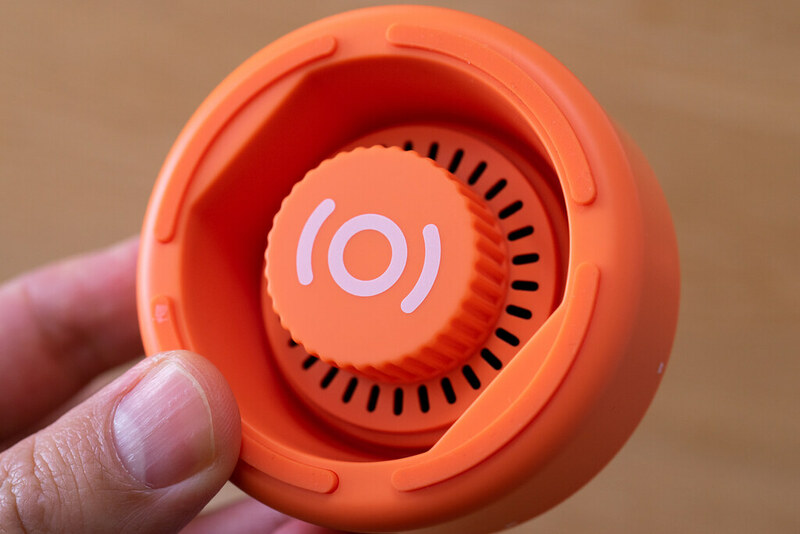 There are many products in crowdfunding, and it’s fun to follow the process to see if they make it into the commercial market or not. 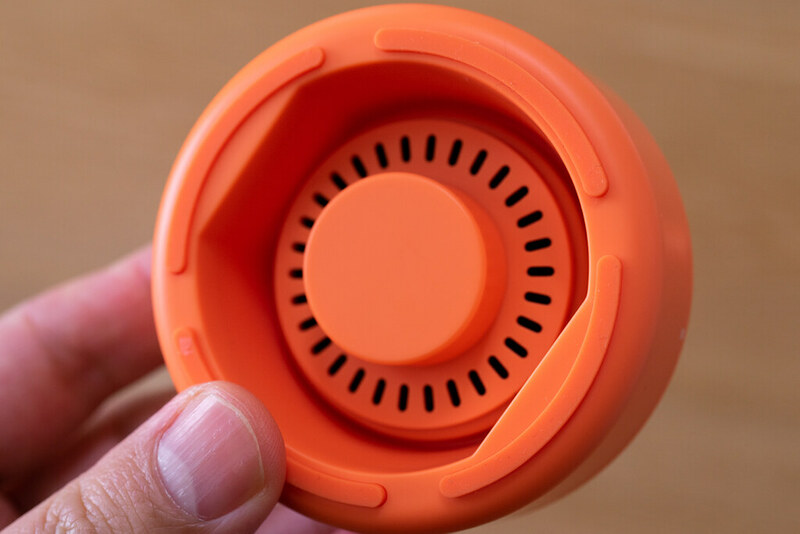 In addition, it is interesting to see all the solutions for “technical challenges”, and the product introduced this time aims to solve the problem of missing bass in small portable speakers by connecting it to a plastic bottle. The project has been closed at the end of August 2018 on Kickstarter when the project was successfully funded. 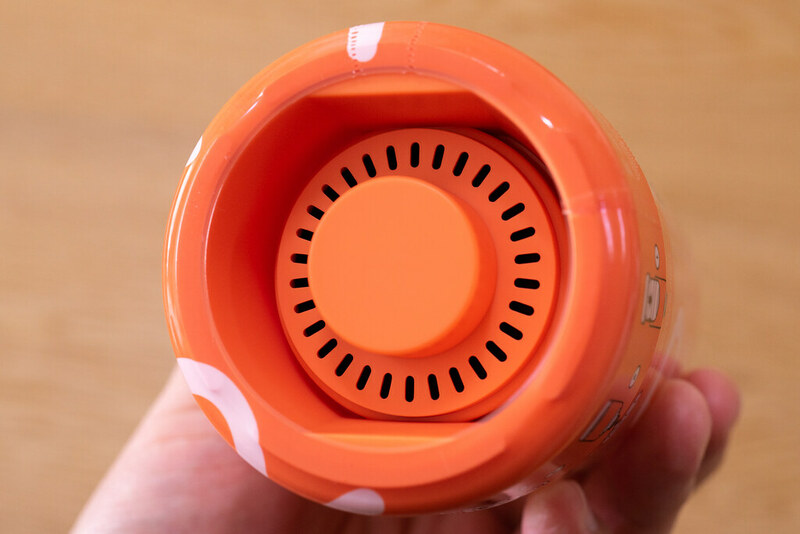 the product arrived in March 2019, and we wanted to review it! The speaker arrives in a package of cushioning material and cardboard, and it is tightly wrapped around the product. 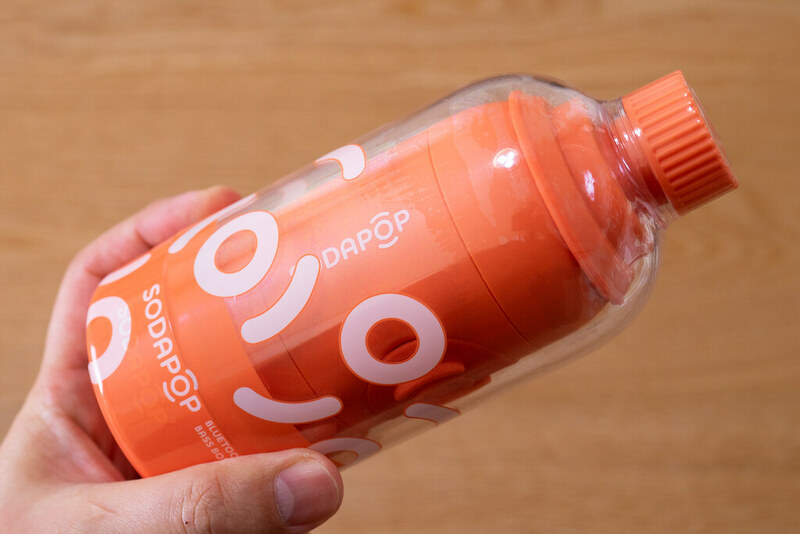 It is the orange version of Sodapop that appears from the inside. Of all six colors, I chose this because it looked the most beautiful. This is the size compared to iPhone XS Max. The size is like a cup of coffee. Looking at the bottom of Sodapop, there is a slit in the circumference. This mystery will be revealed later. 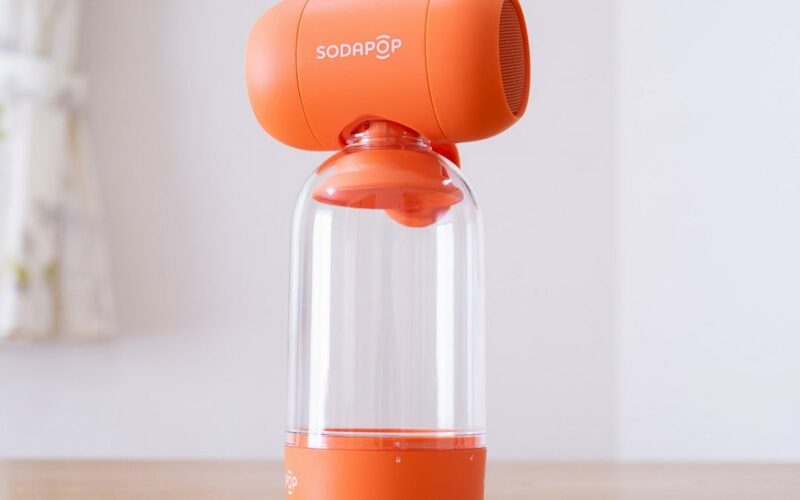 Let’s actually assemble it and check how the Sodapop sounds. 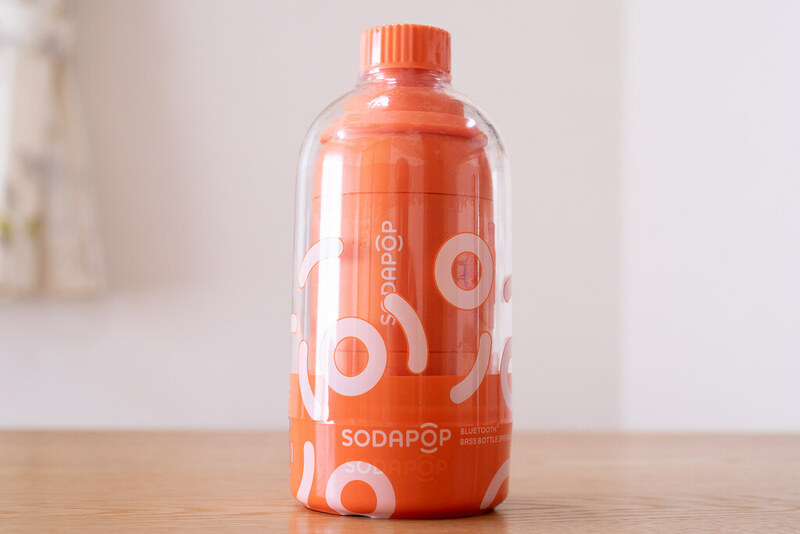 Strip off the shrink-wrap on the outside and finally meet Sodapop. If you take off the shrink-wrap, it looks like a glass case. As it is designed to be locked, turn it to open it. It feels tight. This is what happens when you break the Sodapop into parts. The upper part of the bottle has a trumpet shaped plastic part, but apart from that, it looks like a standard plastic bottle opening. 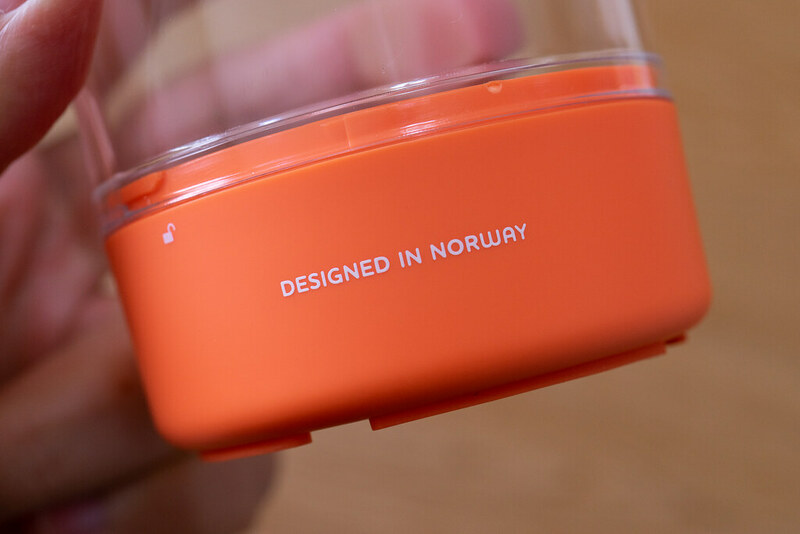 If you look at Norwegian design, you may think of “nordic design”, but if you look at the Sodapop Web site, it says “Scandinavian design”. Scandinavian refers to three countries, Denmark, Sweden and Norway, and Finland seems to be included by definition. Seeing it from Japan, it feels Scandinavian. If you look over the bottom of the lower part, there is a slit, this back side is just woofer parts. In addition, the lid of the bottle was supposed to fit on this central projection. 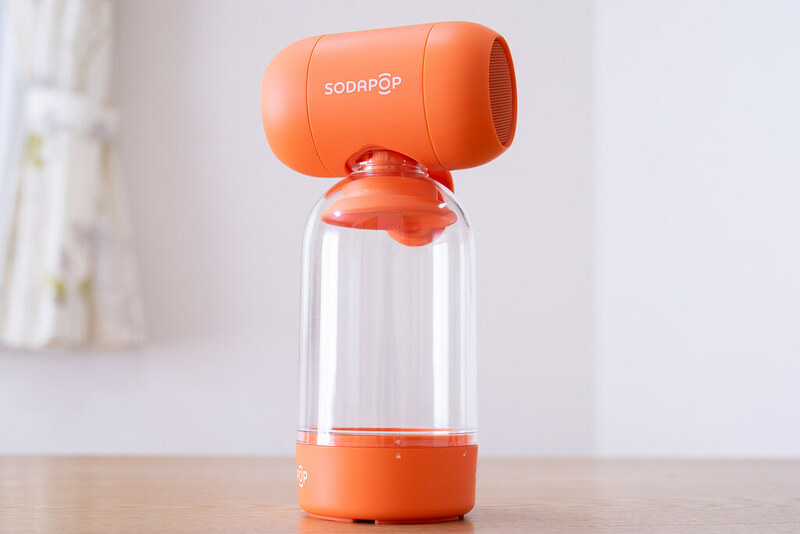 Well, the main part of Sodapop is the wireless speaker unit. It has a nice shape. 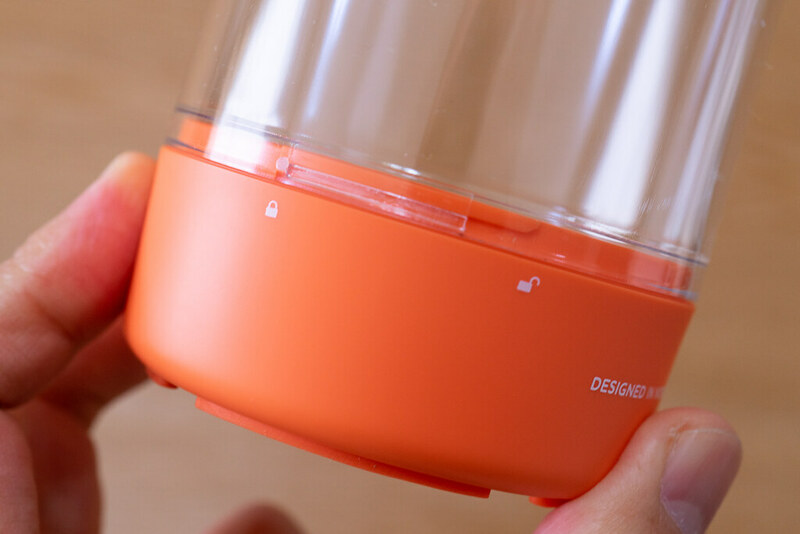 At the top of the back, there is a power & pairing button, and a volume button on the left and right. 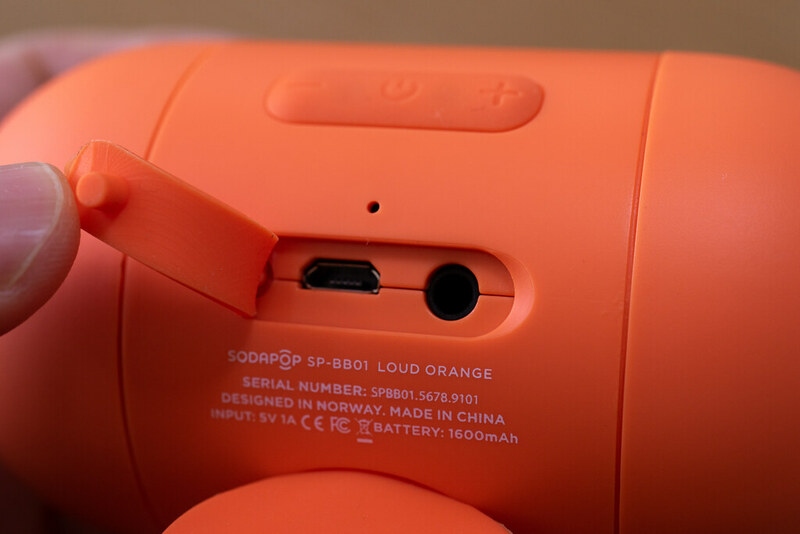 Also, there is an LED between the +button and power button, but it not easy to see in a photo. 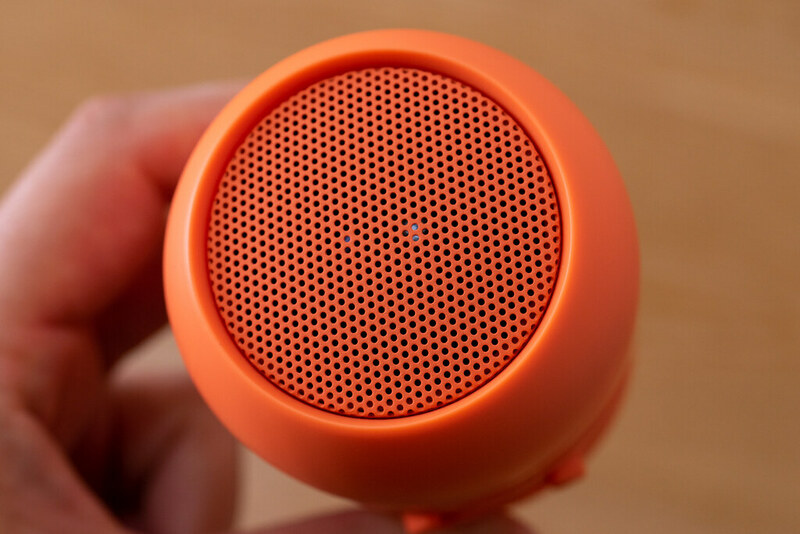 This speaker unit itself is an independent Bluetooth wireless speaker, so when you press and hold the power button, it will be in pairing mode and you can pair it with an iPhone or other device. At the bottom of the back there is a MicroUSB port for charging and a port for analog input. 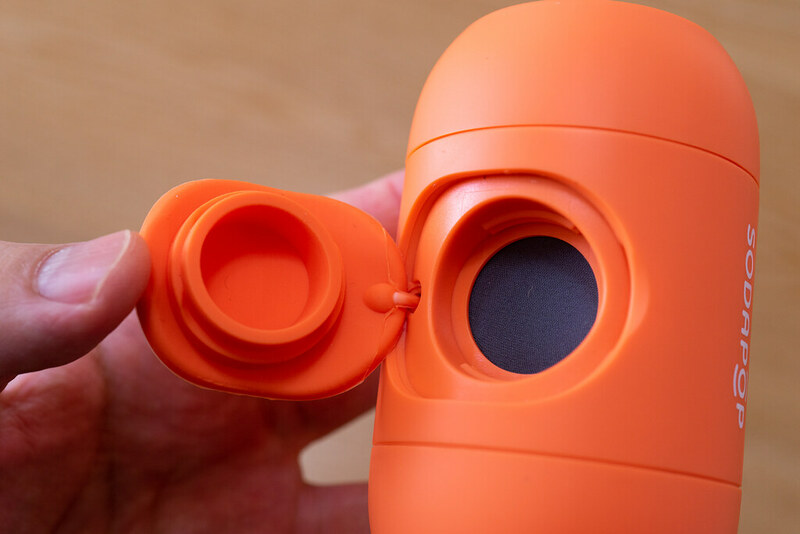 If you open this lid, a hole and a filter will appear. 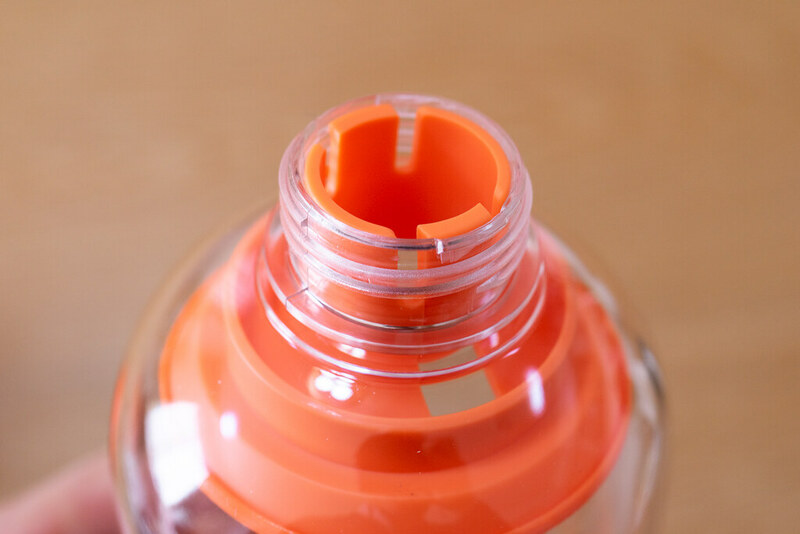 In addition, this hole has a groove corresponding to the mouth of the plastic bottle. Screw the bottle and reassemble again to complete the Sodapop. When you listen to music from the paired iPhone, the sound spreads into space like a 360 degree speaker. The bass seems to be coming out quite well. What kind of gimmick is this bottle? 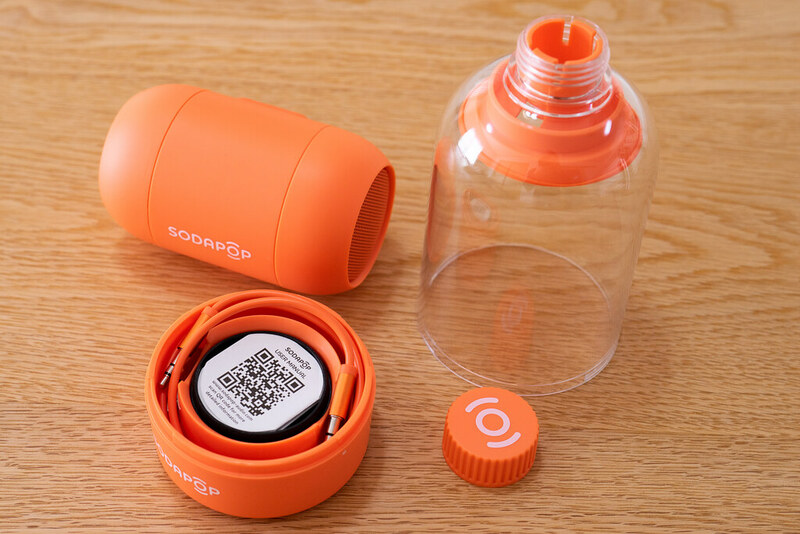 The sound of Sodapop is supported by the woofer parts at the bottom of the bottle. It becomes like this when the flow of the sound from a speaker unit is made into an arrow. 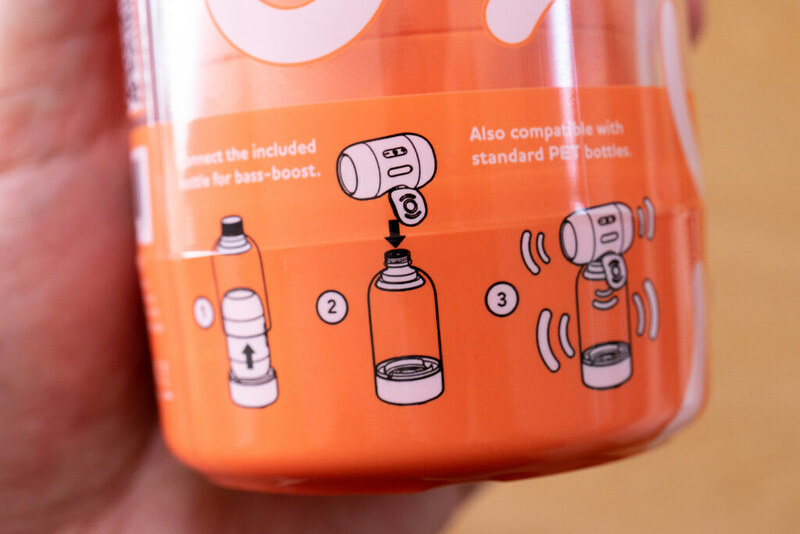 The air coming out of the bottom of the speaker shakes the woofer parts mounted on the bottom of the bottle and plays a role in amplifying the bass. 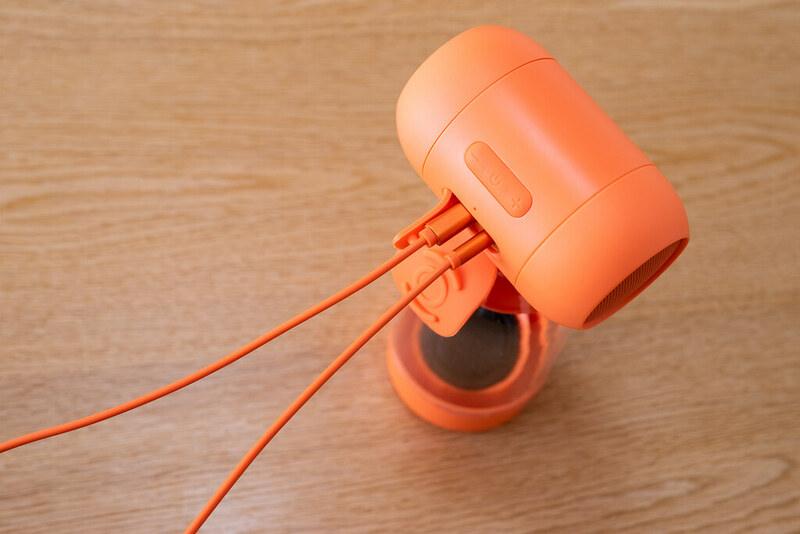 It seems to be a very good speaker. 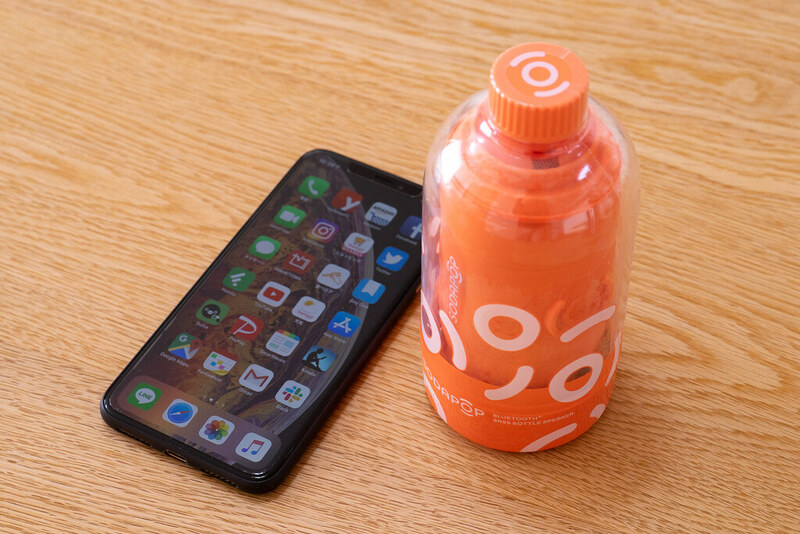 Even though it is such a simple gimmick, it plays very good and there is a big difference with or without the bottle. 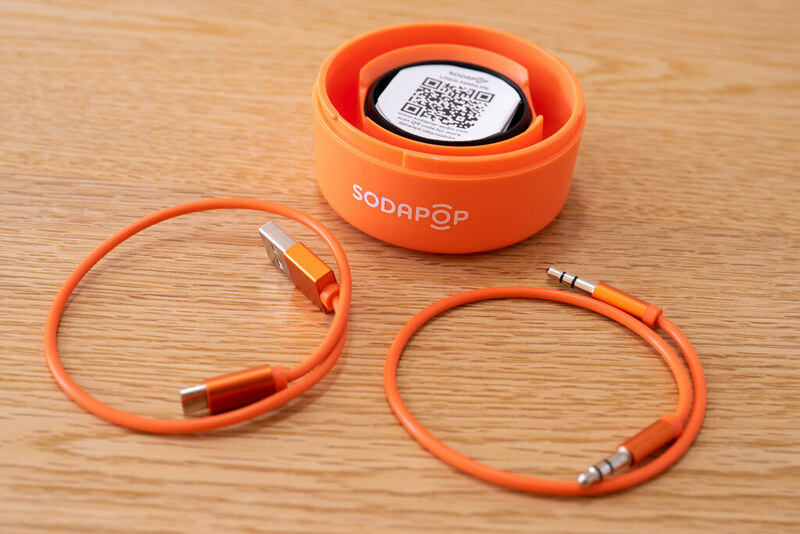 What is the sound quality of Sodapop’s wired connection? We try the input from the back by wire. Even so, it is beautiful when the color of the main unit and the cable is uniform. 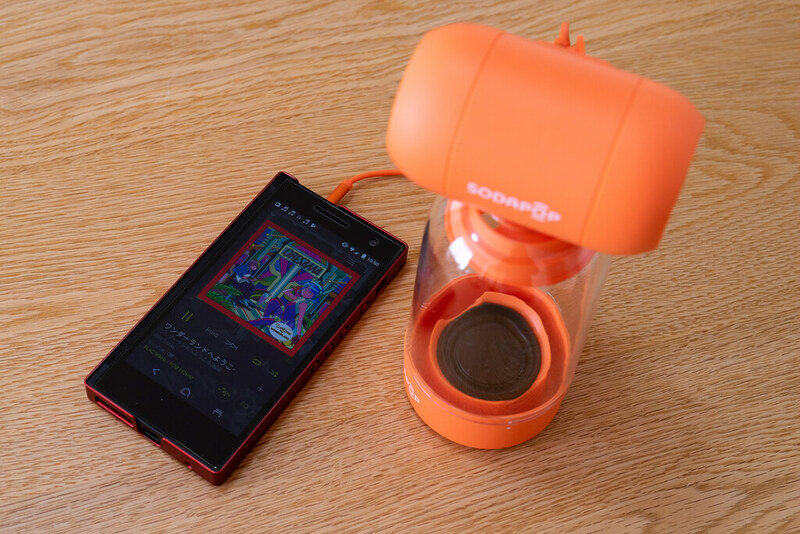 Connected is ONKYO DP-CMX1 GRANBEAT, which boasts the strongest sound quality of smartphones. It is also good to take it out and use it outdoors. 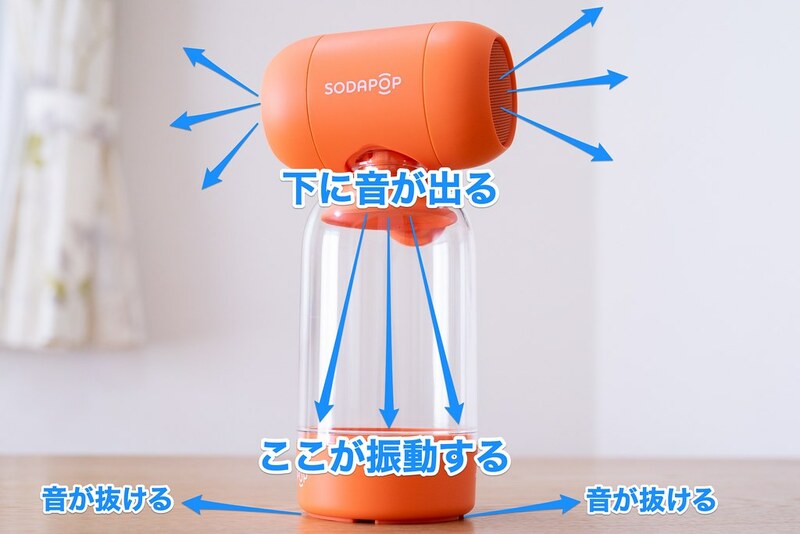 The speaker connection of Sodapop is similar to the one used in most plastic bottles in Japan, so I could attach a common 500 ml plastic bottle. 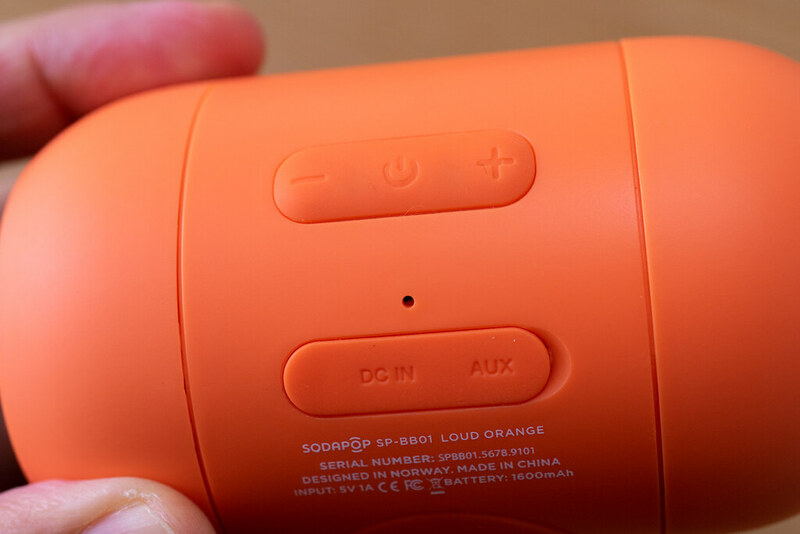 Since there is no bottom woofer part, the sound does not spread to there (though it is much better than using the speaker as it is). But it is best with the original bottle. However, being able to use a general-purpose plastic bottle is a considerable advantage depending on how you think. 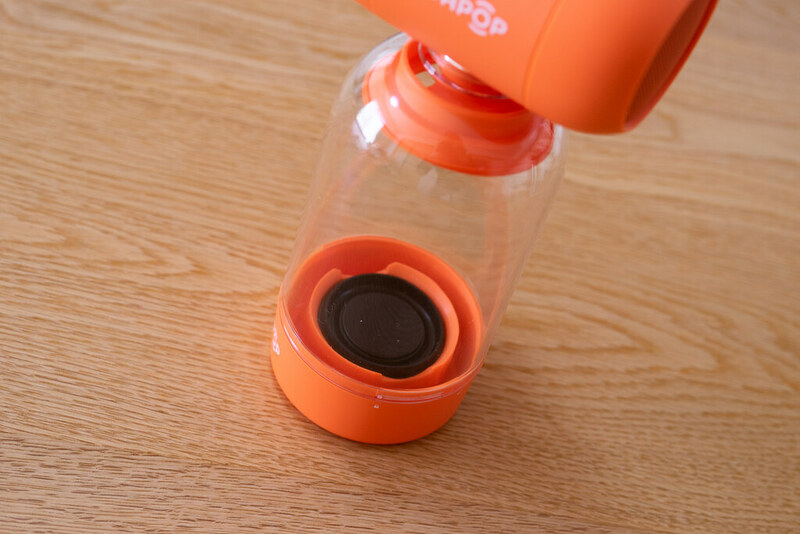 For example, if you set up Sodapop in an empty 2-liter plastic bottle for outdoor barbecue etc., it will be a simple stand and you can make sounds at high positions. There is no need to use a bulky tripod or table. 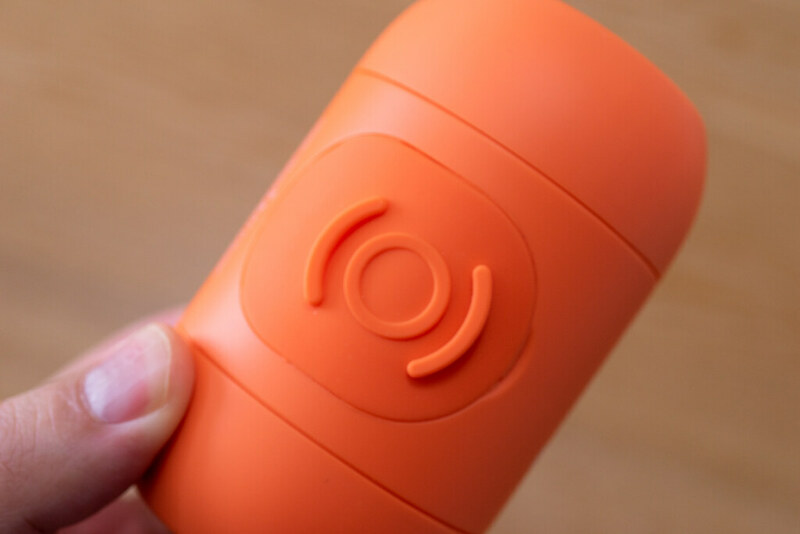 It is a wireless speaker like a science experiment, but its ability is real. Crowdfunding is fun because you can find such a hit. 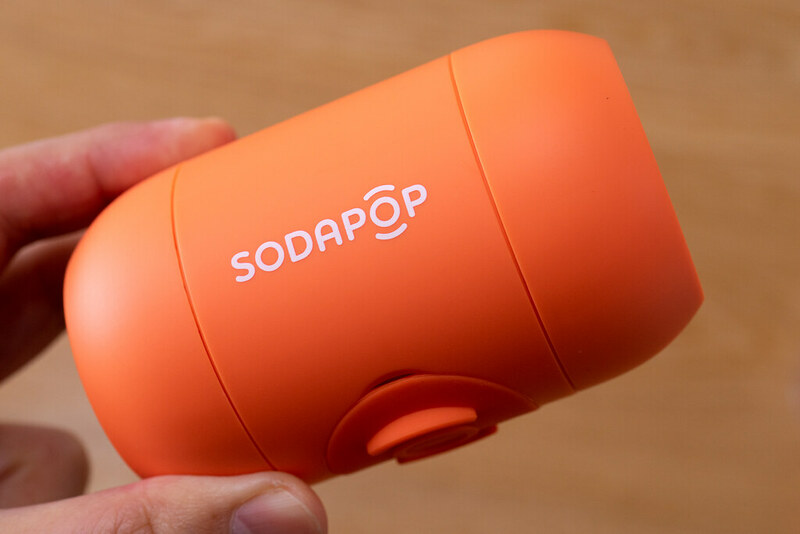 Sodapop is a super interesting gadget that reinvents the bass. Because it can be used like a 360 degree speaker and is about BOSE’s SoundLink Revolve + in size, I will be using this speaker in the future. 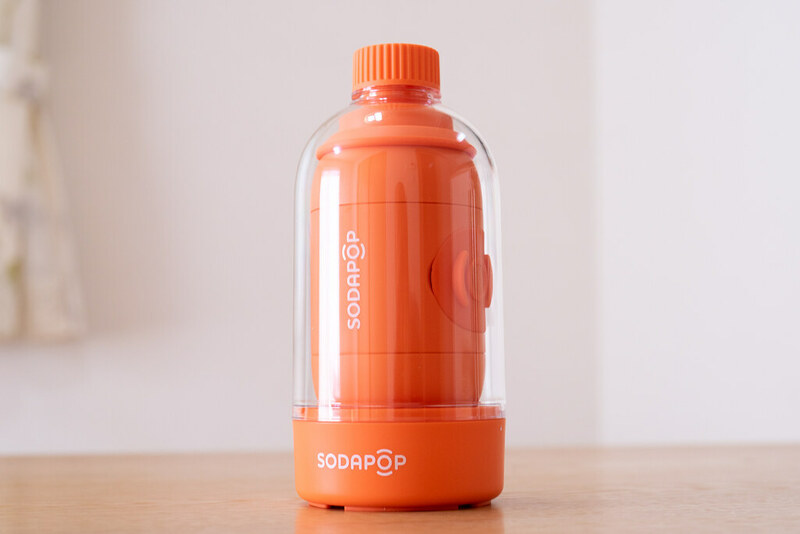 If you are interested please visit the Sodapop official site.